Precursor Games has announced that they have shifted their Shadow of the Eternals crowdfunding efforts from their self-run campaign to Kickstarter. 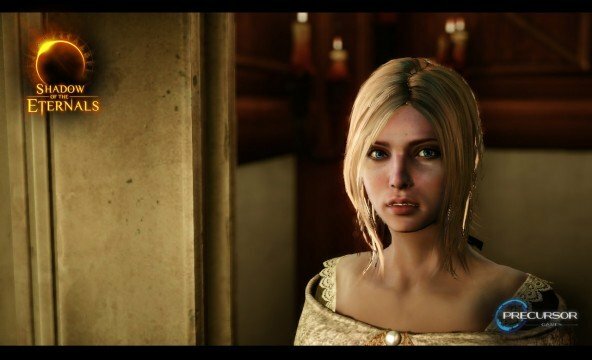 At the same time, some interesting new details have emerged about Silicon Knights, the Eternal Darkness IP, and all those computers that Precursor Games “bought” from SK last July. The website itself has been updated to reflect this change in crowdfunding focus, however, it is unclear exactly how Precursor Games will handle past and future donations that are made directly to them. The self-run crowdfunding campaign no longer appears to have any end goal (the original goal was $1.5 million), and donations currently stand at $156,080 from 2,524 pledgers. Now that the focus has shifted, it appears that those direct donations will be rolled over to Kickstarter, however, the website does not specifically state how (or even if) this will happen. Precursor Games has also updated their Facebook page to note that the entire Shadow of the Eternals project now rests on the Kickstarter campaign. Currently, the Kickstarter effort is lagging behind with a total of $58,135 raised. Assuming that the two funds will get rolled together at some point, this means Precursor Games has accumulated $214,215 in pledges over the last ten days. Based on that trajectory, the studio will hit $728K when the Kickstarter ends in 34 days — far short of its $1.35 million goal. As for the unofficial connection between Silicon Knights, Denis Dyack, and Precursor Games, some new and very interesting information is starting to surface. Last week, Precursor Games CEO Paul Caporicci revealed that the studio is made up of former Silicon Knights employees who are using wiped computers that were “purchased” from Silicon Knights. Additionally, he admitted that Precursor itself had bought some of Silicon Knights’ art assets, which are being used for Shadow of the Eternals. According to what is left of Silicon Knights, this is not entirely accurate. Speaking to Game Informer, Silicon Knights chief financial officer Mike Mays revealed that employees who were laid off (some of whom started Precursor Games shortly after) were told they could “take computers” with them. Those staff members who took SK up on this opportunity were allowed to do so on an unspecified later date, after the computers were wiped clean — per Epic Games’ legal action against the studio. Mays also tackled the subject of the Silicon Knights art assets that Precursor Games claimed to have purchased and is using for Shadow of the Eternals. According to the SK CFO, those assets were not sold to Precursor but were instead bought by individual employees, who were given the option of purchasing them at the time they were laid off. Denis Dyack apparently did not buy any of the assets, however, Mays confirmed that other current-Precursor employees did take the option. The interview also covers the topic of Eternal Darkness: Sanity’s Requiem, which is the spiritual precursor to Shadow of the Eternals. Apparently, Silicon Knights owns “very little” material from the GameCube game, and the IP is “owned entirely by Nintendo.” This fact seems to lend some credibility to the unconfirmed report stating that Silicon Knights’ pitch for Eternal Darkness 2 fell apart when Nintendo decided not to fund the project. Finally, Mays revealed that Silicon Knights as a company is currently made up of “more than one” person, and they are “mostly working on legal issues.” Last October, Silicon Knights staff numbered less than five, and Denis Dyack confirmed last week that he is no longer the president of Silicon Knights. It is unknown who else is currently working at SK. While we still don’t know the whole situation surrounding Precursor Games, Silicon Knights, Denis Dyack, the Eternal Darkness IP, and Shadow of the Eternals, it is clear that there is a lot more going on here than what Precursor first owned up to. We will keep an eye on this story are report more as it develops.